Home › Curtain Walling › What is Curtain Wall? This blog has been created to give you a very brief overview of what curtain walling is and the different types of curtain walling available. All of which are products available from Dortech. Should you require any further assistance after reading this information, please feel free to contact our Sales team on 01484 451177 or sales@dortech.co.uk. Curtain Walling is a non-load bearing glazing system which is generally hung on a buildings structure (hence the curtain reference), but can also be dead loaded. 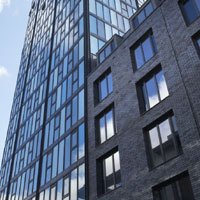 Curtain walling forms an integral part of a buildings envelope and there are a number of factors that must be taken into account during its design including; weather tightness (air permeability, water tightness, wind resistance), acoustic requirements, thermal performance, solar shading, and ventilation. 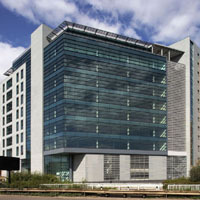 Curtain walling is usually characterised by a square or rectangular grid of mullions and transoms, however designs can be further enhanced to incorporate facets, curves and sloped roofs, Curtain wall facades can also incorporate a variety of inserts including; Windows (parallel opening vents, concealed vents, tilt & turn, pivots, top/side hung), photo voltaic panels and Doors. 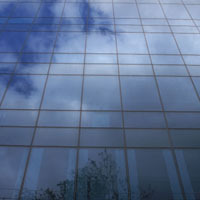 The curtain wall facades aesthetic appearance can be manipulated to offer a flush appearance with the exclusion of face caps (SSG), or can be given enhanced vertical or horizontal emphasis using a Trame/Aerofoil face cap. 3) A face cap to give a neat external finish. Dortechs Trame systems can either be applied vertically or horizontally. The systems are generally specified when building designers wish to create enhanced vertical or horizontal emphasis in a curtain wall screen. 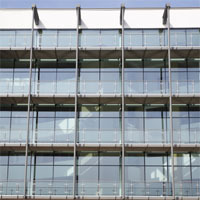 Trame Horizontale: An ‘aerofoil’ external face cap is applied to all horizontal sections of the curtain wall screen. This cap generally extends 80mm out from the glass face. Further extension is made possible with extension pieces. Vertically, the face caps are removed and replaced with either a flush fitted gasket or silicone application. Trame Verticale: This curtain wall system works on the same basis as Trame Horizontale however the emphasis is placed on the vertical sections which have ‘aerofoil’ face caps instead of silicone/gasket. The horizontale sections have either silicone or a flush fitted gasket applied to them…. The first is based upon specialist double glazed units which are manufactured to include an SSG spacer bar which incorporates a ‘U’ channel. Typically the spacer bar will have a bronze anodised finish. Structural silicone is used to bond each piece of glass to the spacerbar. Once the curtain wall grid has been erected on site, these specialist glass units are delivered to site and locked into the grid using metal toggles…. ‹ What Is The Best Brand of Silicone Sealant?